Just when I was about to turn the page from winter to spring recipes, the wind picked up and temperatures plummeted. It may be spring on the calendar, but here in Connecticut, we’re feeling winter’s last gasp. So here’s a recipe from The New Basics cookbook that our family has enjoyed for years. I just managed to snap one photo. This soup was devoured by the whole family, even the non-vegetable lovers (who of course removed the spinach with surgical precision). 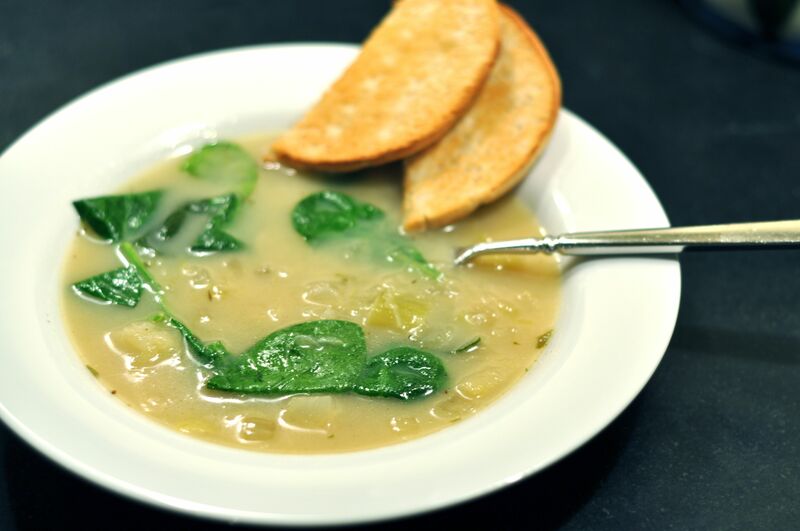 Here’s to hoping we’ll move on to cold soups soon. In a large soup pot, cook bacon until the fat is rendered; remove discard or save for a salad topping. Add butter, leeks, onion and celery to the pot. Cook over low heat until wilted, about 15 minutes. Add the tarragon, thyme, salt and pepper. Add stock and potatoes. Simmer until tender but not mushy, about 15 minutes. Add half the spinach and the cabbage, simmer 1 minute. Remove the soup from the heat. Puree half the soup in a food processor or using a stick blender. Simmer over low heat, and add the remaining spinach and the cream. Heat well but do not boil. Adjust seasoning and serve.